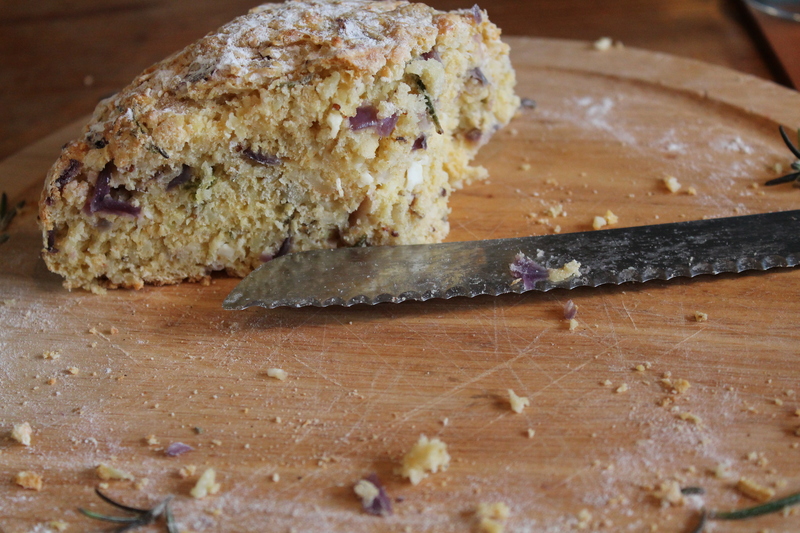 My life seems to consist of quick meals…quick pasta, quick noodles, quick risotto and this feta, potato and rosemary bread requires no bread flour or yeast, no lengthy kneading or resting and is extremely quick to chuck together. I’d hate to buck the trend! I found the basis for this in a magazine years ago, I think it was a Delia Smith recipe, but I have since tinkered with the ingredients trying different combinations to see what works best. I like to use goats cheese, a good artisan Cheshire or even mozzarella (which is a bit soft, but the kids love that stringy-cheese effect) red onion goes well, spring onions, finely shredded leek or lots of fresh herbs. Have an experiment! Whatever you choose to add the process is the same, you literally just shove all the ingredients in a big bowl, add an egg and milk, mix and bake it. 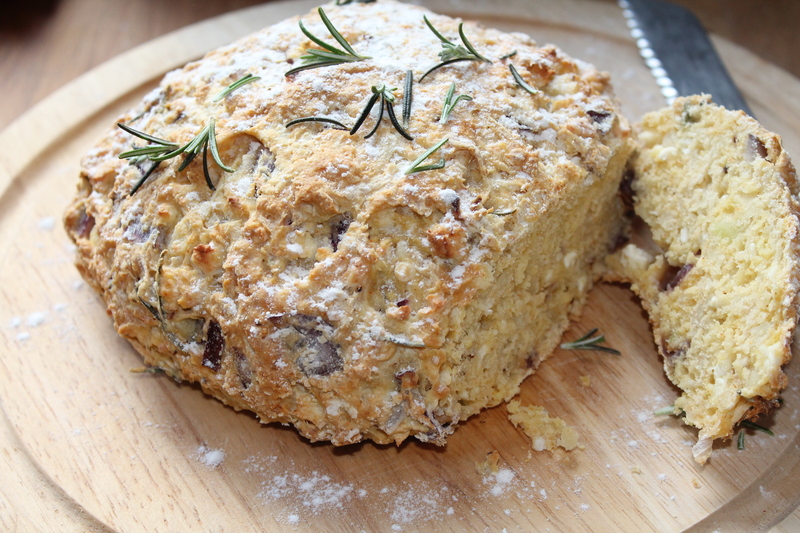 For bread purists this is more akin to a savoury tea bread than a traditional loaf. I make mine with self-raising flour, some good feta cheese (I used a local goats milk feta from Y Cwt Caws) fresh rosemary from the garden and a large grated Blue Danube potato so its stuffed full of tasty ingredients. I ate my freshly baked bread with a creamy tomato and basil soup made with the first crops of Isle of Wight tomatoes which are just now becoming available. I warn you though its seriously addictive and once you start you wont be able to stop pulling or slicing little bits off and nibbling, convincing yourself that you can get away with just one more piece, until all of a sudden you’ve eaten the whole lot. Oh well, its full of good things so why not! half an hour later that’s all that was left! 120g semi-hard cheese (feta, goats cheese, artisan Cheshire, even mozzarella) rind removed (if it has one) and chopped into small cubes. In a large bowl mix the flour, salt and paprika. Add the grated potato, onion or herbs, and cheese and mix with a flat palette knife until combined. Add the milk and egg mixture and keep mixing until it comes together. Form into a loaf shape with your hands and transfer to a greased baking sheet. Sprinkle a little flour and some finely chopped rosemary leaves over the top and bake in a preheated oven, gas mark 5/190 degrees C for about 45 mins until golden brown.